The team at TrySegway (Paphos Experience) welcomes you to our beautiful and historic corner of Cyprus. As the first Segway Authorised Tour in Cyprus and one of the most highly recommended activities in Paphos by Trip Advisor reviewers, we take care to give you a safe and fun filled introduction to the natural beauty, local culture and history of this fascinating island – whilst riding on one of the coolest machines in the world – the Segway Personal Transporter. 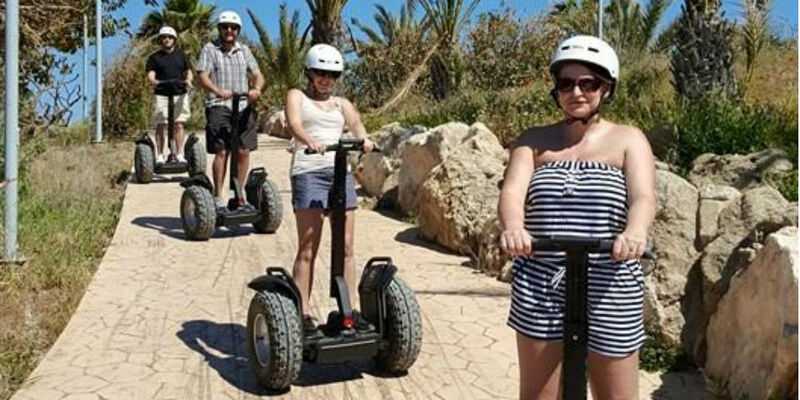 We offer the widest range of Segway experiences in the Paphos area – catering for all budgets and levels of “Segwaying Skills” from nervous beginners to seasoned pro’s. Our guides will ensure you get a great orientation to the area you visit, with a smattering of interesting facts – and a few myths – courtesy of our local knowledge. All our experiences are “Personal” and “Private” – we cater only for small private groups to ensure we can tailor various aspects of the experience to your particular needs or wishes – and there are plenty of photo opportunities to capture a record of your adventure with us – we take photos for you – for free!